You can now save multiple views of your Roadmap to capture configurations that you can return to at any time. 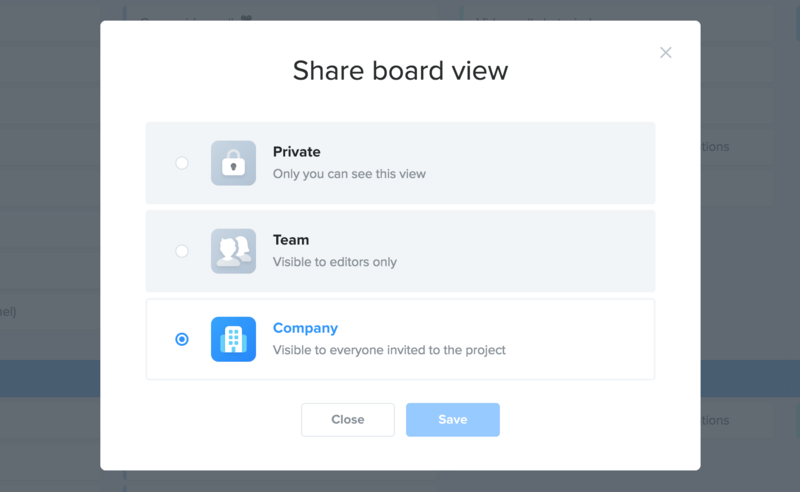 Customize each view's sharing settings to keep it private, share it with the product team or your entire organization. When experimenting with views you’ve already shared with colleagues, any edits you make will only be pushed out for others to see when you save the view to publish your changes. Rest assured, no matter what view a feature is displayed on, its status and release will always remain up-to-date. You can also now drag 'n drop features and releases to re-arrange them right from the Roadmap! Note: Drag 'n drop currently limited to Roadmaps arranged By features. You'll notice we've reflected the latest updates to saved views on the Features board as well. That includes drag 'n drop to re-order your views! If you're using the JIRA integration, here's a small change you should know about. We're updating how reporter and assignee fields get populated when a productboard feature is pushed to JIRA. We made the change after learning that most of you consider the feature owner to be the product manager, whereas the JIRA assignee is the person actually developing the feature. While you can't yet assign a feature to a developer right from productboard, at least it will be easier to see which issues still need to be assigned to someone in JIRA.